March | 2014 | Careerschap | The musings of a careers professional in the higher education sector. Sharing practice: Why we should try and do better. One reason I populate this blog with my thoughts on career is that it serves as a way to share practice. Which in a roundabout way fulfils the reflective side of my personality as well as encouraging the pursuit to get better at what I do in my current job as a Careers Consultant. We often endorse and strive to share best practice but very often – if we are honest with ourselves – how far do we go in achieving this? Are we as effective at pointing that lens at ourselves as we are to the clients that we support? I think we can always do more. I have made a conscious effort over the last few months to start being more proactive in sharing my thoughts on my work. Whether this is in my blog, conversations with colleagues, or contributing to online discussion boards via LinkedIn or other forums. I think some of this stems from my teacher training days – a very much missed period when I actually had time to read entire books and engage in debate without work getting in the way! A key part of the PGCE back then was understanding how we deliver, acquire and process information into learning and knowledge. 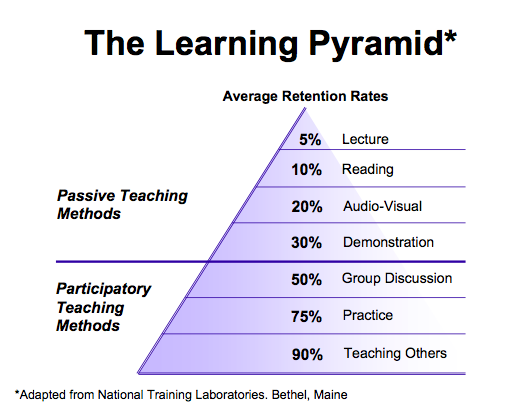 Our group was introduced to the learning pyramid, which I’m aware has its limitations and sceptics not least of which in the assumption we all learn in the same way, but it does at least allow thought and debate on the modalities of teaching and learning and what approaches we may/may not adopt. My own perspective is that although I don’t necessarily buy into the stated retention rates (i.e. under demonstration surely this would be affected by who was demonstrating and how engaging they were to each audience member) and the increments used. It does however seem logical and intuitive, based on my own experiences, that I’ve learned more when practising and teaching others than I ever have just sat in a room listening to a death by PowerPoint. The breaking down of the silo mentality within organisations. Promoting constructivist learning in allowing individuals pre-contemplation before sharing their knowledge with others. Sharing practice can encourage access to other modalities for recipients. i.e. do some further reading, group discussion, watch a video. As humans we are naturally inquisitive and questioning but allow fear of scrutiny and challenge to sometimes get in the way of openly sharing and debating with others. Surely organisational culture can only be challenged when we challenge ourselves to actively share and collaborate? 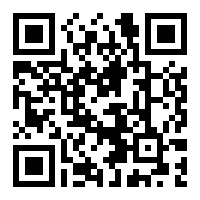 Edit: In the spirit of sharing I’ve added a QR code image as the featured picture for this post which links to (and shares) my other blog entries. I’ve been reading a series of contributions from key influencers on LinkedIn under the title “the best advice I ever got”. It’s quite addictive once you get started reading them. The format is simple. The author writes a short piece on the most influential advice they ever received and comment on how it has shaped their life and career in a positive way. Forbes also collated a selection of what the ten top influencers had to say. Having read through quite a few now I’ve added some condensed extracts below so you can get a feel for the type of advice given. Impact: Time to think and time to connect with people are as important as getting everything done. Sometimes you have to go slow before you go fast. The best advice I’ve ever received was from my father when I was 12 years old and willing to listen. He told me that with my personal characteristics, I could, if I set my mind to it, do anything I chose. Impact: I’ll never forget the favour my father did me when he instilled in me the tenacity I needed to build a career based on what I love most. The best advice I ever received? Simple: Have no regrets. Who gave me the advice? Mum’s the word. Impact: When I was a child, she inspired me to take risks in all manner of business ventures. Most of them didn’t work out (notably growing Christmas trees and breeding budgerigars!) but the lessons learned were invaluable. The best advice I ever received was not really advice but more of an approach to living. It applies to several aspects of life: careers, relationships, sports; health and wellness, and probably many others. Impact: Serendipity fits with my approach in that it’s possible to put yourself in a position to benefit from an unexpected occurrence if you work hard and make the right choices. At this moment in time I’ve probably read through about 50 of these over the last two weeks. Some commonality between them all is that the advice given created a powerful resonance for that person. That ability to evoke long lasting memories and emotions we keep with us. It subsequently changed the way they thought and acted (which goes back to a previous blog post of mine on the importance of recognising paradigm shift moments). So we are now exposed to thousands of examples of advice, proverbs, inspirational stories in our lives. It is hard to now look through your own LinkedIn or Facebook news feed without someone having referenced or shared a cliched (yes, I’m a cynic at times!) quotation of some sort. There are far more outlets in which we can now share and connect our thoughts which for me makes it interesting in how one key piece of advice can really influence and change your life. What wasn’t a surprise was that out of the stories I have read so far, no one has said “my Careers Adviser gave me the best ever piece of advice”. I’m fairly confident as I carry on reading that not one will say that either. This shouldn’t be construed as any sort of failure on the part of practitioners or the process of careers guidance in general. Like I said, we are exposed to tens of thousands of pieces of advice through various channels so the work we do represents a minuscule part of the total. It is also important to note that a large portion of the “best advice ever given” came from somebody who knew that person really well such as family or friends. Just think about how the effect of the exact same message could change if it came from someone you didn’t like or respect. What we also have to appreciate and acknowledge is the professional space in which we work. No careers practitioner is hired to exclusively trot out sagely words of wisdom. Guidance is as much about the process as what is said. I also think there is an arbitrary nature to the notion of having to describe and evidence “the best ever piece of advice” I ever got. Why not then have the second best piece of advice and the third and so on? Over time it is often hard to recall what words have had what effect and influence so perhaps we clutch on to the most memorable depending on what synapses were firing at the time. In summary, if nothing else, have a read through some of the stories. Quite a few of them created some resonance with me and there is value to be had reading through them. Finally, in the spirit of these stories I wanted to share some (indirect) advice that created lasting resonance and influence on my life. It wasn’t given to me by family or friends but rather from the film “The Pursuit of Happyness” [sic] starring Will Smith (I’m not normally one for spread thickly sentiment, but we don’t always get to choose what creates those paradigm shifts, however it is a great film). In the 2006 film Will Smith’s character – whilst fighting homelessness and trying to make it as an intern stockbroker – says the following to his young son. I remember hearing that the first time and missing the next 10 minutes of the film because it just made me stop and think. I thought about it at random times for weeks afterwards as well. Eight years on and it still influences how I approach challenges in my life but also in how I approach my practice. 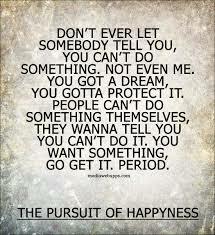 I didn’t take from it the fact we can always achieve everything we want. Sometimes we are presented with barriers that mean some things are just not possible or worth pursuing in life and career. I just feel we should always feel empowered to make those decisions for ourselves and not by somebody else. It’s something I’ll keep telling my little boy when he is old enough to understand. I’ve been having a play with Google Trends which basically analyses keyword searches compared to the total % of searches completed during that time. It essentially shows the popularity of a search (or not) which is where the trends part comes into play. What is quite useful, amusing (and geeky) is comparing search terms against each other. So in this search I compared the search terms connexions, career help, national careers service, cv writing and apprenticeship. Not surprisingly, the search term “Connexions” has taken a gradual decline as news filtered through of its gradual demise and decommissioning. The term “apprenticeship” appears to have been fairly stable in the UK but is also in common usage in Australia, Canada, Zimbabwe and South Africa. Interestingly the term “CV writing” has had a slow decline since 2004. No doubt impacted by the emergence of online applications and professional networks such as Linkedin. Having stirred my interest I had a look at some social media search terms. Comparing the search terms Linkedin, Twitter, Myspace, Google+, Blog allows us to see the potential adoption and popularity of social media tools as well as being able compare them against each other and their own product life cycle. I missed the obvious (facebook) as when I included that it was so overwhelmingly popular you could barely make out the other search terms (have a go, you’ll see what I mean). Poor old Myspace warrants a mention from its lofty heights in 2007 to obscurity in 2011. It certainly reminds us that social media has a life span. 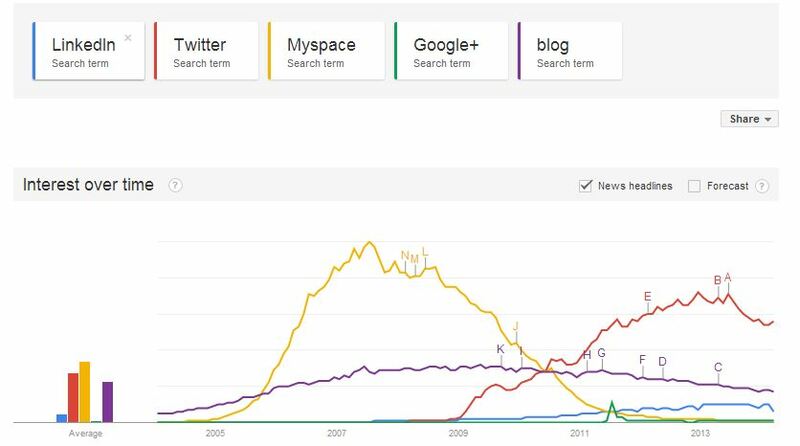 Twitter has obviously surged from 2009 whilst Linkedin maintained slow progress (in search terms that is). Now the search terms don’t stack up against the usage terms, so have a look at these statistics here as a guide for comparison. So how do I think Google trends can be useful in a careers work context? I’ve given it some limited thought. Here are my ideas so far. 1) It’s quick to compile simplistic comparisons of search terms. So you could analyse the popularity of the search term “careers help” over the course of a year. Perhaps spikes indicate when you could optimise a career support campaign. 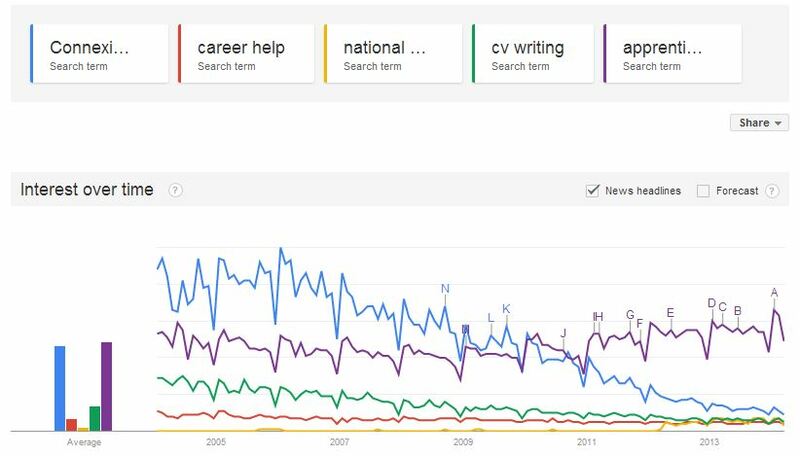 2) Look at the popularity of careers related words to understand what help people are really searching for. A simple market research exercise. 3) Choose trending topics (careers related) to write about, perhaps from a career service blog. 4) Use trending search terms (again related to careers) for SEO purposes for your careers website. Try and get more traffic. 5) Along with usage statistics, you can check website and search engine term hits of the popular social media sites. Make sure your careers service is adopting/shifting its focus to the right technology. I’m sure I’ve missed lots. But hopefully it’s got you thinking. For fun have a look at the google trends for the UK or change the setting to whichever country you are viewing from right now. Oh, and take a look at what the world searched for most in 2013…..